With all of the necessities a homeowner must have to maintain a beautiful home, garage plans with a workshop or loft can be a highly functional designs that suit storage and hobby needs for the busy homeowner. Choosing a garage with a workshop or loft in the plan gives a homeowner flexibility to use the loft for a variety of uses such as a home office or storage area. Plus, a workshop will please any hobby enthusiast or the family handyman with all the projects that come along with home ownership. 745 Sq. Ft., Width 40'-0", Depth 22'-0"
216 Sq. Ft., Width 36'-0", Depth 26'-0"
261 Sq. Ft., Width 34'-0", Depth 27'-0"
171 Sq. 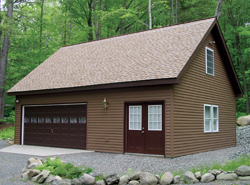 Ft., Width 34'-0", Depth 27'-0"
Our collection of project plans includes many styles and sizes of garages with a workshop of lofe area perfect for your needs. We offer detailed blueprints so you can visualize the look of the entire finished project, right down to the smallest detail. With a wide variety of plans, we are sure that you will find the perfect do-it-yourself project to fit your needs and lifestyle.